If you are a new visitor to the Lake District it might be worth mentioning that, Windermere itself is not on the Lakeside. The town that has lakeside frontage is Bowness-on-Windermere, just south of Windermere village. The bustling Lakeland town of Ambleside is at the very northern tip of Lake Windermere and has some lake frontage. We think you will love these carefully selected cottages, chosen for their charm and often with stunning views allowing you to both enjoy all the amenities these honeypot towns and villages have to offer coupled with a fabulous place to relax. Please note that this property is on the main road between Ambleside and Hawkshead so some traffic noise can be expected. Pullwood Estate is set in 50 acres of woodland and visitors can walk to the lake (Windermere) which is about a ten minutes through the woodlands. A jetty and bench are at the lakeside perfect for enjoying the vista; boats and canoes can be launched via vehicular access - please read more of these details and see further photos of The Coach House at Pullwood here. 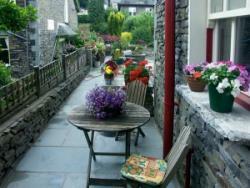 Previous couples have loved this cottage for its Cumbrian charm. Do note that the lounge and bedroom are combined and the feature exposed beams may mean that you need to watch your head! If living the rural Cumbrian dream for your next holiday with walks from the door is what you are looking for, then check out availability and see further photographs and read reviews of Barker Knott Farm Cottage here. Middlebeck Cottage could just be your perfect escape with River Rothay providing the tranquility for your holiday, yet just a short stroll and you are in the hustle and bustle of everything Ambleside has to offer, including of course a great choice of places to taste a local pint or a glass of bubbly, a Cumbrian Sausage or a fusion meal. What we love about Duckling Cottage is not jus that your welcome pack includes duck feed for the lovely ducks and swans down in the bay but that it has everything you need in walking distance from one of Lake District hot-spots. 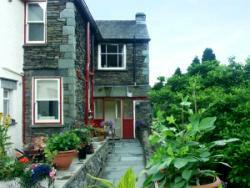 With two double en-suites this cottage would make an ideal choice for two couples (and their pet!) who want to be right at the heart of the Lake District. There is a small courtyard with table and chairs if you want to stay home and if the weather is Lake Districty then there is the open fire in the lounge to comfort you too. Being easily walkable to the centre of Bowness we feel this self-catering will also appeal to families with teenagers who may like to come and go at their own pace? Read more about Duckling Cottage here. Calgarth is described by previous guests as a true Lakeland gem. Great attention to detail both indoors and outside too. Troutbeck bridge is walkable and there are some lovely walks and pubs from Troutbeck village and of course Bowness, Windermere, Ambleside and Hawkshead are a short drive away too. There are more photos of Calgarth and guest reviews here. The shared grounds of Ruscello are beautifully maintained and will be an added treat to a stay in this well thought out apartment. Though on the ground-floor please do note that the shower is over the bath and also there are steps within the apartment and from the driveway to the entrance of the apartment. T'Whit T'Woo is most definitely all about location, location, location. With lake access this self catering property is a real find!. Boats can be launched at Ferry Nab and moored at the jetty, but not overnight. The jetty is perfect for kayaks, wind-surfers or just those atmospheric sunset photos! See more photographs and read all the details of this lake access self catering property here. This traditional terraced cottage is in a great location if you want to be in walking distance of the popular Lakeland town of Ambleside. See further photographs and read more about Two Tweenways.